In pressurized water reactors the water that is pumped through the core containing the fuel rods is under pressure (about 15 MPa) to prevent its boiling. 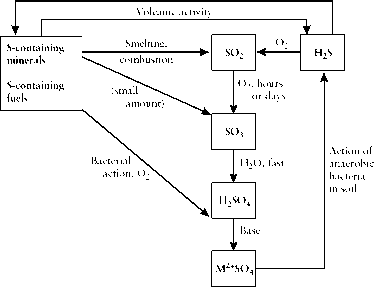 Hydrogen is injected into this primary loop to suppress the formation of oxygen by radiolysis of the water and thereby prevent the oxygen concentration in the core from reaching a value high enough to make an explosive mixture. The water (at about 316°C) in the primary loop is pumped through steam generators (e.g., four), where heat that has been removed from the core is transferred to water to generate steam in the secondary coolant loop as shown in the simplified schematic diagram of Figure 14-12. 31The first nuclear-powered (PWR) naval vessel was the submarine USS Nautilus, which was launched in 1955. The first central station, commercial nuclear power plant in the United States was built in Shippingport, Pennsylvania, and began operation in 1957. The reactor was a PWR and the electrical output was 90 MWe. 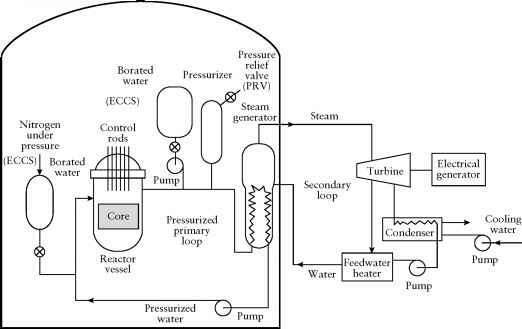 FIGURE 14-12 Simplified schematic for a pressurized water reactor (PWR) nuclear power plant. about 60 ft long and about 15 ft in diameter. The entire reactor complex, with its control rods, primary loop, pressurizer that maintains pressure in that loop, emergency core cooling system (ECCS), and steam generators, is located in a specially designed containment building constructed of reinforced concrete (about 1m thick) and having a steel liner (about 0.4 m thick). The purpose of the containment building is to prevent the release of radioactivity into the environment if the reactor is involved in a steam or chemical explosion. The version of a PWR developed for use in submarines and in power plants in the former Soviet Union is known as the VVER (Russian acronym for water-water power reactor). 33The reactors are also referred to as PHWRs. deuterium uranium) reactors. In HWR plants D20 under pressure is circulated through pipes containing the fuel in the core and then through primary loops and heat exchangers, where it transfers heat from the core to H20 in the steam generator. Because D20 is a better neutron moderator than H20, the fuel is natural uranium rather than the LEU used in LWRs. Unlike the LWRs, the HWRs are designed so that they can be refueled without being shut down.